Thirteen of our middle school and upper elementary students, and head of school, Leslie Hites, along with faculty members, Nathalie Hites and Emily Ahsoon, will be traveling to China this week for the Montessori Model United Nations in Zhengzhou, China. Since last summer they have been preparing for the conference. They have been learning about the United Nations and reseraching Costa Rica and Thailand, the two countries they will be representing. One way they will be showcasing their knowledge is through position papers. Fossil fuels were first introduced by a man named George Agricola in 1556 and then later by Mikhail Lomonosov in the 18th century. Although fossil fuels made people’s lives a lot easier at the time, it is now known that it destroys our Earth. Today, the main problems with using fossil fuels are that we are running out of them and that we are destroying our planet. It pollutes the air by releasing carbon into our atmosphere which destroys the ozone layer and makes the air unsafe for us to breathe. The carbon traps heat in our atmosphere. Eventually the heat will melt the polar ice caps, which will make the sea levels rise. This will flood cities near sea level. It will also make many species go extinct, by changing their habitat and changing air and water temperatures. The best alternative to fossil fuels is renewable energy, which is energy that can always be produced because it doesn’t take millions of years to make the source. Renewable energy is good for the planet because most don’t pollute. In order to save the planet, everyone should use renewable energy. 1994: Law No. 7447 was passed. Article 38 of this law says that if you purchase equipment to produce renewable energy, you will not have to pay a sales tax, select consumer tax, or the taxes described in Law No. 6946 (LA ASAMBLEA LEGISLATIVA DE LA REPUBLICA DE COSTA RICA). 1995: The Environmental Law states that Costa Rica has to investigate renewable sources of energy. 2000: The National Energy Plan set a goal to increase the usage of renewable energy, except for hydropower, by 15%. 2003: Directive 22 in the National Development Plan encourages people to use new, renewable methods of creating energy. 2007: The National Climate Change Strategy is a strategy to become carbon neutral by the year 2021 and to promote renewable energy, social development, economic growth. 2008: The National Biofuels Programme is an agreement to promote the use of biofuels (ethanol), which are a form of renewable energy, in Costa Rica (Murillo). 2008: The National Energy Plan is a national agreement to lower the country's energy bill and the release of carbon into the air, and depend more on renewable energy. 2010: The Government proposed to eliminate all taxes on equipment and machines used for renewable energy generation (http://thecostaricanews.com/costa-rica-to-double-power-generation-within-6-years/2974). 2011: Costa Rica signed a law to protect the environment against the dangers of drilling for oil by preventing oil drilling. 2014: Costa Rica extended their ban on oil drilling and production from the original law (2011) so that it extends until 2021. These policies have led to increasing renewable energy use in Costa Rica. These two projects are examples of the kind of development that are encouraged by these laws: At the Rio Azul plant, landfill gas is being used to generate energy in San Jose, Costa Rica’s capital. The Cote hydroelectric project in Guanacaste is generating 7MW of energy. Today, 95% of the electricity used in Costa Rica comes from renewable sources. However, their energy supply is unstable because it largely relies on hydroelectric power and Costa Rica has had droughts which have led to power outages. This is why finding other energy sources is important to Costa Rica. Costa Rica is a part of the United Nations Energy Plan (UNEP) and has applied to the International Renewable Energy Association (IRENA). It has also ratified the United Nations Framework Convention on Climate Change and the Kyoto Protocol, which both promote the use of renewable energy. 95% of Costa Rica’s energy is renewable because Costa Rica’s government invested in it. However, 80% of Costa Rica’s electricity is produced by hydropower (Mack). This is a problem because if there is not enough water, they can’t produce enough hydropower. A solution for this problem is to diversify the types of renewable energy that Costa Rica uses; Costa Rica has been doing this recently. Costa Rica believes that other countries can and should invest in renewable energy. Countries can support this idea by creating laws that promote renewable energy. These laws can include tax incentives that help people save money when they use renewable energy sources. Countries could also invest in building facilities for creating renewable energy. They could also invest in research on new energy sources. Last but not least, countries could also set goals that encourage them to increase the usage of renewable energy sources. Works Cited-Removed for this blog post. The complete list is available upon request. Our trip to Mono Lake was fantastic – in so many ways! We made very good time on our drive here. One of the advantages of a small group is that everything takes less time! The students all had a great time in the car. They started off with a rousing game of Hearts, followed by time reading, resting, and setting up the meal preparation/clean up schedule for our week here. The drive also gave us the opportunity to observe how the vegetation changes as we traveled across the state. It was most exciting to note that we saw the same progression of ecosystems last week on our trip to Mt. Diablo as we did on our drive up into the Sierra out of the Central Valley! We were also able to observe the sudden changes from one ecosystem to the next that explain California’s extraordinary biodiversity. Upon arrival, we quickly settled in and dinner was prepared. We were able to spend a relaxing evening at the Outdoor Environmental Center (OEC - where we stayed), listening to a variety of stories about the natural world. We woke up to a gorgeous day! The strong winds (gusts up to 50mph) that kept us indoors had abated, leaving clear skies. We headed out early and took a short hike down to the old marina, on the shores of Mono Lake. Students appreciated the opportunity to see the lake from a different perspective than they had in previous years. We spent time discussing the history of this area. 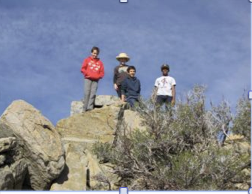 We reflected on how the native peoples of Mono Lake met their needs (eating pinyon pine nuts, alkali fly larvae, etc.) and discussed the ecology of the plants that we observed. Formations of pumice and tufa provided us with the opportunity to discuss how these structures are formed (the former is volcanic and the second results from a chemical reaction between the calcium in spring water and the carbonates in the lake) and to get in some hands-on exploring! Everyone was saddened to see how much the lake has suffered as a result of the drought. It has dropped several feet since last year, resulting in higher concentrations of salts. It was somewhat surreal to peer into the still waters – waters that are typically teeming with millions of brine shrimp. Consequences at a larger scale were also evident: we saw the bodies of various Eared Grebes, migratory birds that stop to feed at Mono Lake on their way south, that died due to the absence of brine shrimp. We had a brief lunch in a park and visited the community garden. It was wonderful to see what they are able to do with such a short growing season! We then headed to Sage Hen Summit – a new destination for all of us. On the car ride to the summit, we passed through a forest of Jeffrey and Lodgepole Pines (actually, it is the largest stand of Jeffrey Pines in the world!). Students' observations resulted in many questions: Why was there no underbrush in portions of the forest? Why were there areas with no trees? Why were there trees here when most of the surrounding land only contains bushes such as sage and rabbit brush? It was wonderful to hear them reflecting on these ecological questions! These are precisely the type of questions that guide ecologists’ research. After a short (but steep!) hike to the summit, students had the opportunity to spend some time reflecting and observing and sketching their surroundings. They then received the answers to the very questions they had posed in the car! We discussed rain shadows, because the amount of precipitation is the limiting factor which will determine whether or not a forest can exist in this part of the world. The students also greatly enjoyed the opportunity to stretch their legs and test their balance on the rocks in the area! On our way back to the OEC, we stopped and played some games in the forest. The students learned a thing or two about their ability to camouflage! At the house, students wrote in their journals and then prepared a delicious dinner! And yet, the evening was far from over! After dinner, Guleed Ali, a graduate student from Columbia University, came to talk to the students about climate change. What an incredible treat! Guleed not only gave a fascinating presentation, incorporating recent research (including his own), he also shared his passion for the topic with the students. He was very impressed with the thoughtful questions posed by our students. It was truly a phenomenal experience! Many thanks to Ben White, an architect and graduate student at UC Davis for recently orga­niz­ing such an incred­i­ble day for our mid­dle school students! The day started with a dis­cus­sion with Jeff Kessler, a chemical engineer and doctoral student study­ing transportation issues related to sustainable development. He started off by demonstrating how magnets and batteries can be used to create a simple electric motor – this is basically the same type of motor used in electric cars! We then spoke about dif­fer­ent kinds of fuel to exam­ine what the different challenges with each type are, includ­ing coal, nat­ural gas, hydro­gen cells, bio­fuels, etc. We also discussed new technologies that are being devel­oped, and the potential impact they can have on trans­porta­tion, from the hyper­loop to selfdriving cars. It was fascinating to hear about how peo­ple are work­ing to decrease emis­sions in transportation! Ben White then spoke to us about the Solar Decathlon project. 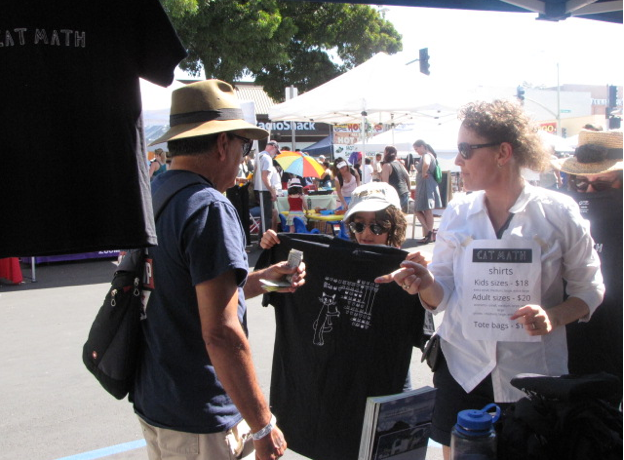 Every two years, groups from colleges all around the world get together in Irvine, California. 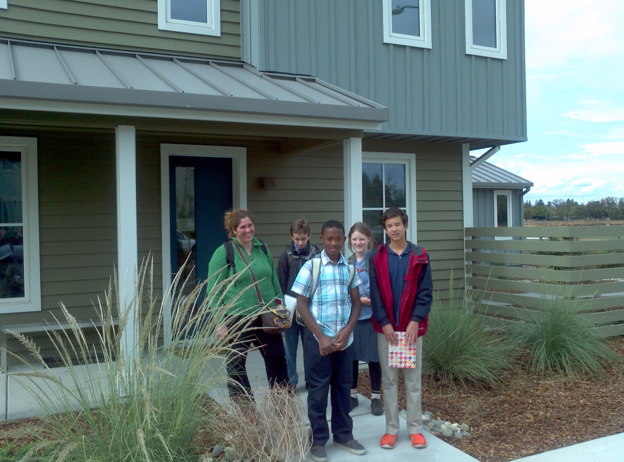 They bring with them zero net energy houses they have designed and built (they literally ship the houses there!). Ben explained that the team at UC Davis has a new goal this year: build a zeronet energy house that is also lowcost. 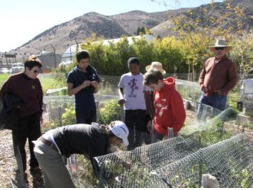 He explained that UC Davis, being an agricultural college, is very aware of the eco­nomic chal­lenges faced by agricultural work­ers. They want to build houses that would serve to improve the qual­ity of life of this pop­u­la­tion. It was amaz­ing to see the sociological effects that such work can have! Finally, we were able to visit the Honda Smart Home – a hightech solar house built as part of an experiment and located in the heart of the largest zero net energy community in the world! We then had a special treat: Eric Anderson, mechanical engineer and doctoral student studying the efficiency of wind turbines, gave us a tour of UC Davis’ wind tunnel! This is where scientists can do actual experiments to study how to improve wind turbines, rather than just using computer models. Eric engaged us in a fascinating discussion of different types of energy, and the particular advantages of using wind as a source of energy. Did you know that it takes 150 gallons of water to power one household for one month using natural gas?!? Imagine how much more water would be available to our drought-stricken state if we used solar (average of 20 gallons a month per household) or wind (0 gallons a month per household). 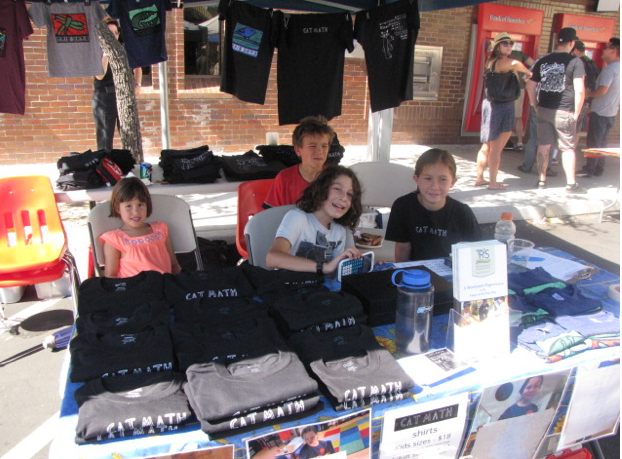 Earlier this month, students from the Upper Elementary and Junior High classrooms at The Renaissance International School ran a booth at the local “Oaktoberfest” celebration in Oakland's Dimond District to sell T-shirts to raise money for their upcoming trip to China. The students will be participating in the Montessori Model United Nations conference to be held in Zhengzhou, where they will be discussing a variety of global issues, including children’s rights, renewable energy, microfinance, and climate change (to name a few). It was wonderful to be able to participate in this lovely community event! Thursday, February 12,--4:00 p.m.-5:30 p.m. The Renaissance International School's Middle School program provides students with a solid preparation for high school. The program includes: 21st century skills; core academics; music; fine arts; language immersion, project-based learning; and travel. Register on the Tour Calendar. Read about our Upper Elementary and Middle School students recent trip to China. Students from Oakland, Berkeley, San Leandro, Alameda, and other San Francisco East Bay cities attend The Renaissance International School, located in Oakland's Dimond District. Tour of Calpine Geothermal Plant "The Geysers"